Goodwell, Okla. — Oklahoma Panhandle State University Student Oklahoma Education Association (SOEA) advisors and members attended the annual Spring Convention and Outreach to Teach on Friday, March 1 and Saturday, March 2 in Tulsa. 11 students and two faculty advisors from Panhandle State attended the two-day event. 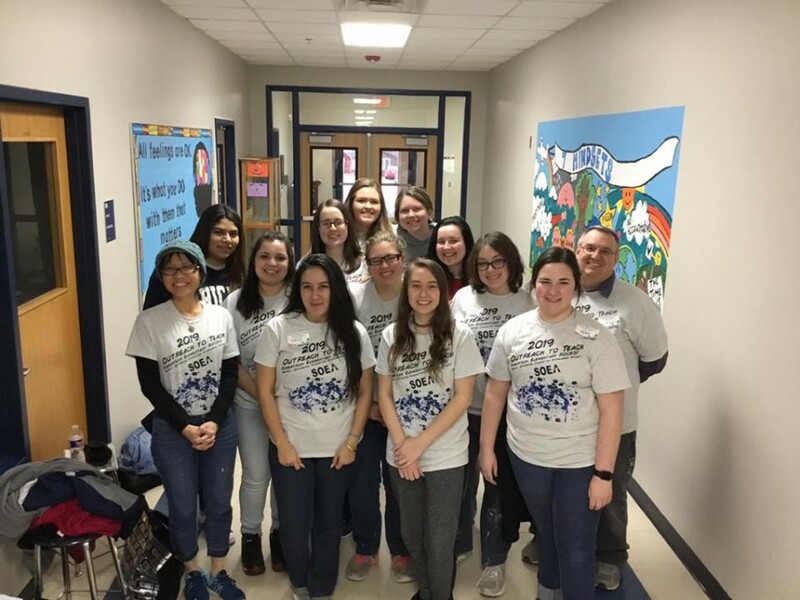 Students and advisors from institutions all across Oklahoma work together each year in the Outreach to Teach project performing school improvements and beautification at a selected elementary school. This year participants got the opportunity to work at Robertson Elementary in Tulsa. SOEA members painted murals on walls in the entrance area and conference room as well as refurbishing bathrooms and the storm shelter. Panhandle State SOEA officers, Nancy Melendez-Trejo, Mariah Morigeau, and Sarah Atha led a team of volunteers in working among four projects. This marked Panhandle State SOEA’s 13th time to participate in the outreach project. The following day, SOEA members were busy attending sessions of profession development and learning new information during the Spring Convention. Panhandle State was recognized as an Outstanding Local Chapter. This marks the sixth time in since 2012 years that the group has been honored with this award. Nancy Melendez-Trejo and Mariah Morigeau were also recognized as state officers. Students attending the conference include Sarah Atha, Nancy Melendez-Trejo, Mariah Morigeau, Ashley Price, Melissa Wiman, Kaylee Johnson, Chantal Guel, Abby Ely, and Aubrey Bowers, Alejandra Hernandez, and JC Deason. Dr. Mihelic and Dr. Wu accompanied the group as faculty advisors.